Easy Blackberry and Apple Trifle is an ideal autumnal dessert to make the most of foraged blackberries and homegrown apples. 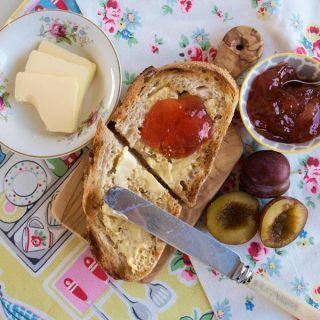 I’m lucky that I have access to all the hedgerows on our farm and I have my own apple tree, but if you don’t have access to the countryside and have no apple tree, never fear, you can buy cultivated blackberries or use frozen fruit and apples are available everywhere and all year round. 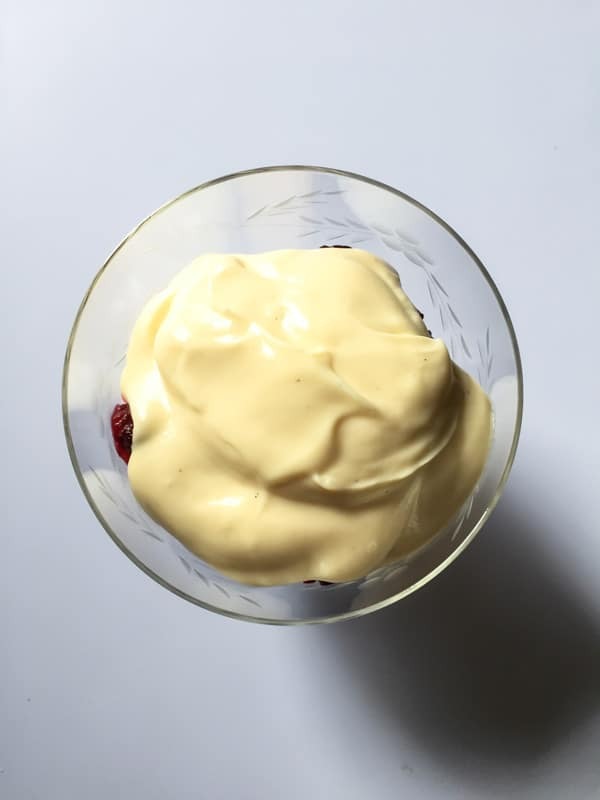 Trifle is one of my favourite desserts, it’s such an easy dessert to assemble and now that you can get really good ready-made custard in supermarkets it is even easier. I start the Blackberry and Apple Trifle with some cubes of madeira cake. You can use other plain cake or even trifle sponges, but I find that madeira cake makes a nice base. It also soaks up the alcohol very nicely. I used the last of my Hedgerow Vodka, but you can use sherry or other fruit liqueurs or if prefer it without the alcohol I would recommend orange juice. 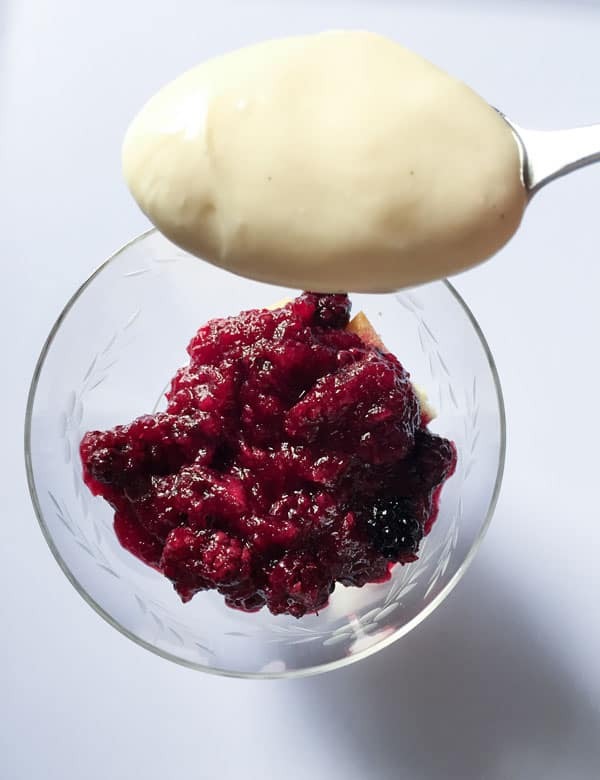 Make sure you add plenty of the Blackberry and Apple compote, it’s the star of the show and, although it is sweetened, it has a nice tart flavour which balances out the custard and cream. Spoon the custard over the fruit compote making sure you cover it with a nice even layer. Now you are ready to whip the double cream just to the point where it will hold its shape. You can pile the cream on top of the custard or if you want to make the Easy Blackberry and Apple Trifle a little prettier you can pipe it onto the trifles. I used a Wilton 1M piping nozzle and started piping from the centre of the bowl. Just before serving sprinkle the trifle with toasted flaked almonds, a fresh blackberry and a thin slice of apple. 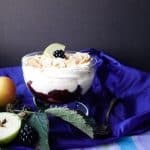 Easy Blackberry and Apple Trifle is a glorious layered dessert full of sweet and tart flavours topped with whipped cream and crunchy toasted almonds. 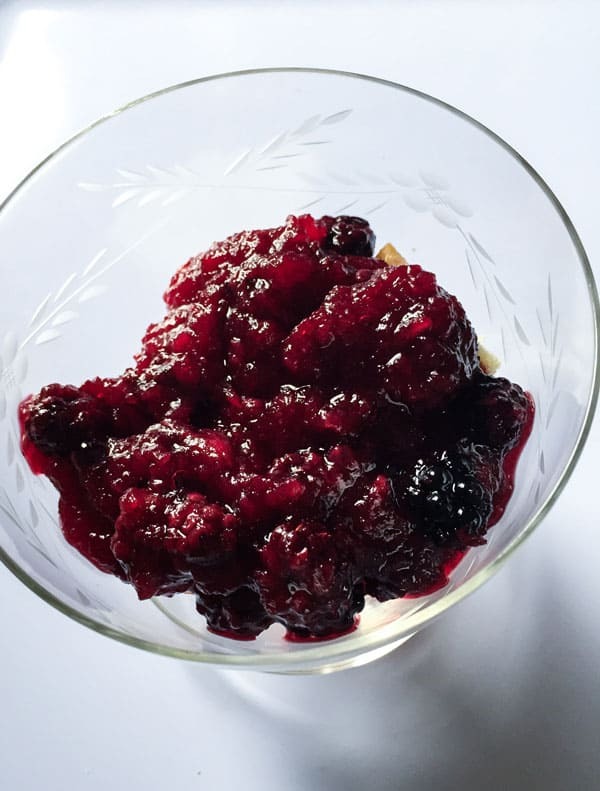 Put the apples, blackberries, sugar and water into a saucepan and heat gently until the sugar is melted. Simmer for 5-10 minutes until the apples have dissolved to a pulp. 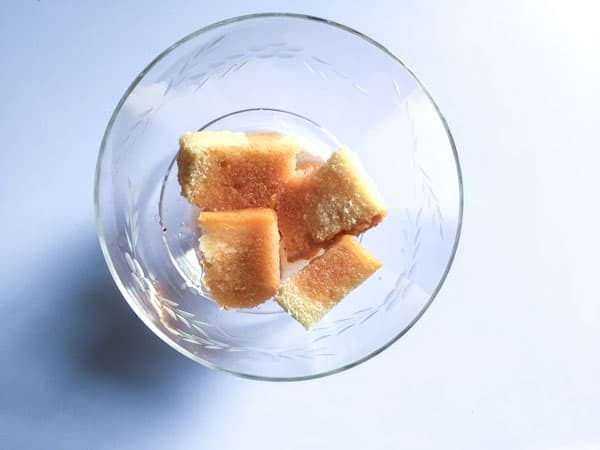 Cut the cake into cubes and place in the bottom of the trifle dishes, divide the alcohol between the four portions, sprinkling over the cake. Spoon blackberry and apple compote over the cake. You will have plenty of compote, so add as much as you like but do cover the cake. Cover the compote with custard. Whip the cream until it is soft but will hold its shape. You don't have to pipe it onto the trifles but it does look pretty. I used a Wilton 1M piping nozzle. If you don't pipe then simply pile the cream onto the custard. Toast the flaked almonds in a dry frying pan on a medium heat, moving them around until they are a golden brown. 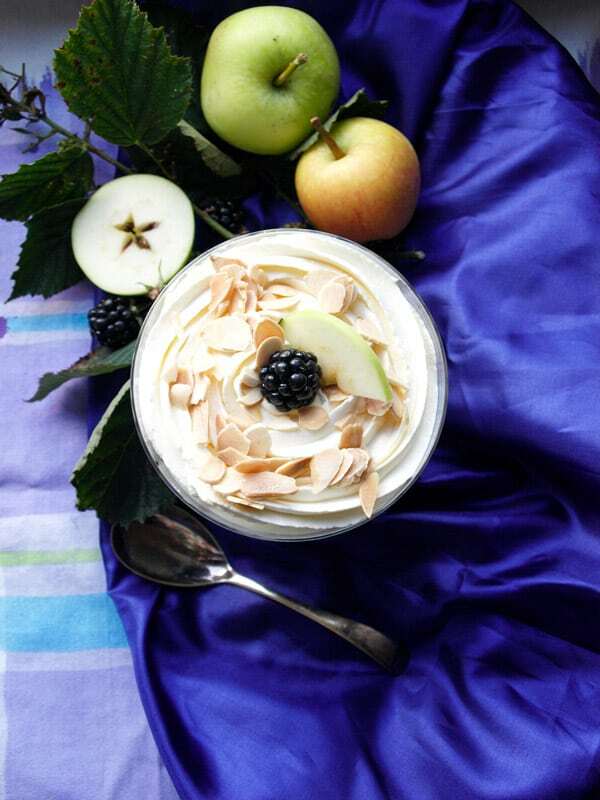 Just before serving, Sprinkle the toasted almonds over the trifles and add fresh blackberries and a half slice of apple. You can make a large trifle instead of individual bowls, just follow the same steps. 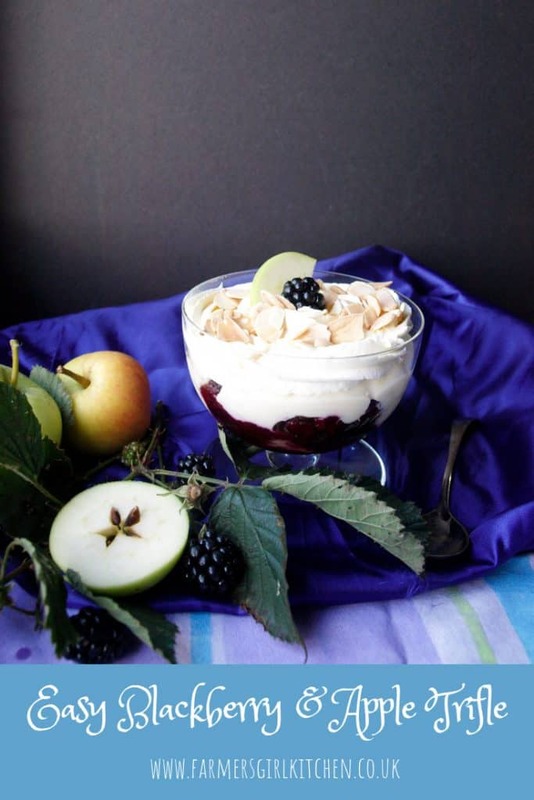 I’m adding this Blackberry and Apple Trifle to the #CookBlogShare link up for bloggers recipes, it’s a great place to find new recipes and new blogs to follow. Thanks, Elizabeth, enjoy the fruits of the season! 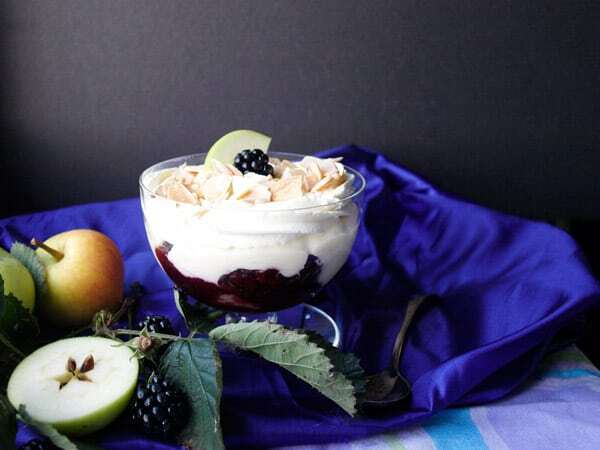 Loving the idea of blackberry and apple in a trifle, must try this! Lovely photos too! Thank you, Camilla. I’m so fortunate to have access to these seasonal fruits in abundance. So I’ll try to include them in every dessert! Oh, you are completely right there Kellie. My granny called trifle with jelly ‘children’s trifle’ and I’m sure it was those packets of trifle ingredients in the 1960s and 70s that created the myth that you need Jelly in your trifle. Mum always made her own egg custard too, at least for special occasions, but the top end ready made stuff is really good and much quicker! This looks delicious, I’ll have to make it as I love a good trifle. Thanks Lesley. Trifle is a great favourite in our house. This is such a lovely trifle recipe! My mum used to make a trifle almost every week when I was growing up and because of that I got bored of it and have never made one myself. However, this looks so good and I love the fact it’s made with foraged berries and apples from your own tree. Thanks Corina. I can imagine how that might put you off! I love foraging for free food and then making recipes for it. 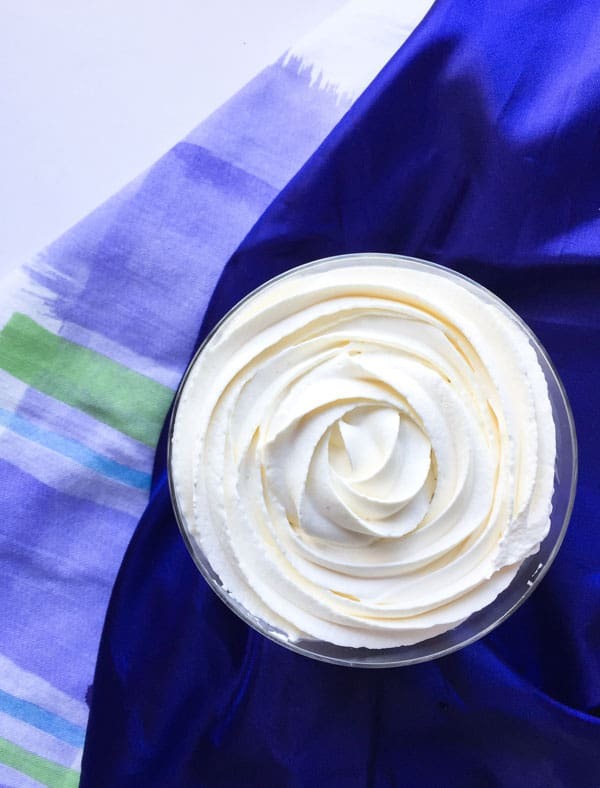 What a great recipe and I love all the blues in your sumptuous photos.Beautiful! Oh, you do know how to make my mouth water. This looks fabulous. I love the blackberry season and blackberry and apple is a classic combination for good reason. Nice video too. I love the blackberry season too, thanks for your kind comments. Thanks, Jo. We certainly do love trifle and that classic blackberry and apple combination. I do love a good trifle and this blackberry and apple one look delicious. Very impressed with the pretty piping of the cream! Thank you Kavey, a little bit of piping always makes things look even more delicious!